On Thursday, the Federal Bureau of Investigation, working with police in New Zealand, arrested the leaders of the popular file sharing service MegaUpload.com and scrubbed the site from the internet, alleging that it supports widespread copyright infringement. Coming just a day after the internet’s campaign against the Stop Online Piracy Act (SOPA), the raid was perceived by many netizens as a declaration of war. Within minutes of the announcement, Twitter accounts associated with Anonymous, the shadowy hacker collective, announced #OpMegaUpload, a massive retaliation against government and entertainment industry websites. Just a few hours later, swarms of computers had brought down the homepages of the Motion Picture Association of America, the Recording Industry Association of America, Universal Music, the US Copyright Service, the US Department of Justice, and last, but not least, the FBI. The main Anonymous Twitter account claimed that it was “the largest attack ever by Anonymous” with more than 5,600 people involved. 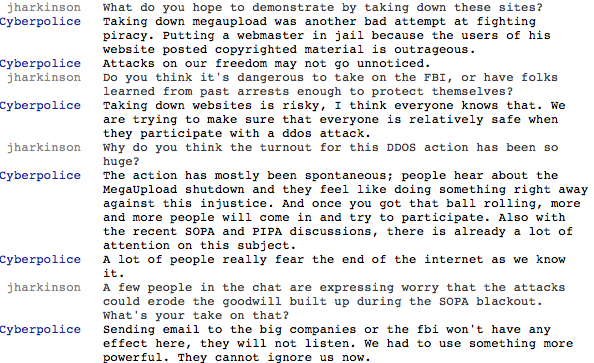 In conversations with other anons, I had a hard time getting a clear picture of why they felt MegaUpload.com was worth defending. Some argued that the arrests were draconian because the site’s primary purpose wasn’t piracy and it had complied with requests to remove illegal material. Others said they didn’t care whether or not the site was intentionally hosting pirated content. And others expressed anger that authorities took the site down without regard to legitimate files that its customers had stored there. “It would be like shutting down YouTube for having copyrighted videos posted,” one anon said.